First and foremost, if you are expecting the drama that many ghost hunting shows portray... pack it in now. Paranormal investigating is a process of research, documentation, recording, videotaping, and hours upon hours of examining photographs and evidence. ( How to Conduct Research for a Paranormal Investigation ) There will also be hours of listening to tapes for EVP's ( Electronic Voice Phenomenon ) studying temperature changes, monitoring EMF meters (electromagnetic field), and gathering all of the evidence to be examined. Then all natural explanations for any apparent activity captured must be ruled out. If you are planning on investigating with a group of people it is preferable to go with people you know and trust. However, if you are going to interview for positions outside of who you know, make sure you ask tough questions to eliminate anyone who is looking for a thrill or who isn't serious about it. Ask the same question in different ways and listen for the answers and any variations. Do criminal background checks as well. Whatever can be ruled out initially as natural causes needs to be done first and foremost. If it is a private residence that is still in use, check for faulty wiring and possible plumbing issues. Old water pipes can make very unusual noises, which are noticed more at night when the house is quiet. Bad wiring can cause power surges, creating an electrical "fear cage"... areas of such concentrated electricity that it can be felt and experienced as fear, physical illness, and paranoia. This can also be caused by living near a large source of electricity such as a power station. Houses are also hotbeds for mold and other toxic substances (such as carbon monoxide leaking) which can cause hallucinations and strange "feelings" or unexplained illnesses. Any environmental toxins of the area in general would need to be investigated as well. 1) If you are going to an abandoned location ASK PERMISSION. Find who owns the property and obtain the proper authorization to be on the premises. Trespassing is a punishable offense, even for a ghost hunter. If the building is dilapidated or condemned... there's a very good chance you could be seriously hurt from the condition of the floors or stairways. 2) Don't ever go alone. If you are not part of an actual paranormal team then take several trustworthy friends with you. Not only is it safer, it provides witnesses for verification of any potential activity. There should be a password that each member knows in case an investigation needs to be ended abruptly. That way if something does happen, there isn't a lot of panicking and ruining of evidence. 3) If this is your own home or one of an individual, make sure everything about the activity has been documented. Interviews need to be done with all parties involved in the investigation. Everything in these time frames should be written down, including everyday happenings, causes of stress for whoever is living in the home, weather... anything that can be written down should be. This will help establish patterns and possibly find other causes for events that seem paranormal. If it is someone else's home make sure extensive questions are asked and notes taken of any potential areas to focus on. 4) Do your research. Paranormal teams each have their own approach to researching the history of the home or property. Some prefer to do the research after the physical investigation is done... some prefer before. Whatever you decide to do, the best place to begin researching a property is the local library by looking at city directories. From there, going to the city hall and local newspaper offices can yield more information. County records will also give property information about who and what was there before. If you are investigating a famous haunted location, there will be many legends that are easily found... but legends are often full of misconceptions. Find out the factual history, and in doing so, make note of any "grain of truth" to the stories about the place. 5) Get the proper equipment... and learn how to use it. You can have the most top of the line cameras, video equipment and recording devices, but if you don't educate yourself on how to properly operate them, your evidence will be faulty. Learn about what settings cameras and video equipment need to be on and make sure the equipment is clean. When recording audio, announce any noises that are made by natural causes. Test and retest the equipment, and always make sure there are plenty of batteries on hand. Sony would be the affordable top in the field here... of course the more complex, the more expensive the camera will be. DVR's will have the advantage of being able to have multiple cameras being used at once, as well as being able to control the settings and speed. IR (infra red) illuminators are especially helpful for recording at night by using LED's (light emitting diodes) to conduct the light so the images can be easily seen. Flir cameras, although extremely expensive, are ideal for capturing thermal images (the heat produced by energy). However, at nearly $30,000, there aren't many teams who have these yet. Digital Camera with minimum picture storage of 300: Again, Sony would be the most widely used and recommended. Make sure the speed and the flash are on the correct settings, as the wrong ones will cause anomolies in the photograph. Having the camera set on manual will allow you to prevent camera shutters from being open longer than necessary, and give you more control with the focus. SLR (single lens reflex) cameras allow you to set the aperture to let the maximum amount of light into the camera lens when the lighting in the room is dim. Shutter speeds should start at about 1/60seconds, which are ideal in dim lighting with ISO's (which measures the sensitivity of the image sensor) set between 400-800. (To listen for Electronic Voice Phenomenon, or EVP): Sony wins again with affordability and clarity. You will want the recorder placed in an open area to pick up any voices that could have an unknown source. In listening for EVP's, make sure that all natural sounds are noted, and that each person hears the recording without knowing what the others heard. The recording should not be altered in any way, however you can slow down for clarity. Class A EVP's are when it can be distinctly heard with no extra clarification. Class B's can be heard with some sharpening... and Class C's are unintelligable sounds. The Trifield meter is ideal for this. It has the advantage of being able to detect fields from electricity, magnetic, and microwave emissions. It is actually preferable to some of the more expensive ones, as it can be purchased for under $200.00. 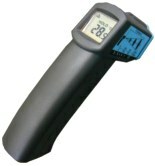 Another meter, which is only slightly more expensive and has a temperature sensor as well, is the Mel-KII Hybrid meter. Before using it in an investigation, become familiar with how it works. 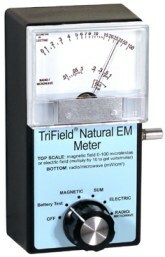 EMF meters were intended for finding man-made sources of electricity, which is what needs to be ruled out first. Readings from natural sources of electricity don't often rise and fall as man-made ones do. This is becoming more popular in the field of paranormal evidence and storing of data. They can store the data collected immediately so it can be downloaded on the computer at a later time. Since they work independently of the computer while collecting the data, they are extremely convenient. Omega is a good brand and works well with most signals such as temperature and sound. For gauging temperature changes: It is often thought that when a spirit is present, a particular room or area will have "cold spots". Keeping a thermometer available will measure any temperature changes that in turn, will be compared with any other evidence. Other miscellaneous items that would be needed are flashlights, batteries, (plenty of spares), notepads (for taking notes during the investigation) and a first aid kit for any emergency medical issues. Give everyone that is with you a different task. One should be taking notes, another should be monitoring the DVR, with another taking the pictures with the digital camera. Any equipment such as data loggers, EMF meters, thermometers, etc. should have constant monitoring for changes, especially if no data loggers are being used. Some teams will use a psychic... if this is done, it is better that any information obtained is backed up by research of the place's history. The psychic should know as little about the place as possible, to see what is felt without suggestion. When setting up your video recorder, make sure it is firmly on a tripod (if one is being used) and that the night vision is enabled. Make sure there is no one smoking and that everyone participating remains still. During the recording, it is a good idea to snap several pictures, making sure that the straps and other attachments are removed from the camera. Be sure you are using the flash if it is at night, and that the photographer's hair is completely pulled back and out of the way as not to interfere with the image produced. Take several pictures of the same area for later comparison. When recording for EVP's, be sure that the digital recorder is completely charged and is placed in an area where nothing else is around. Make an announcement at the beginning of the recording telling who is there and a brief summary of what is going on. Begin asking a few questions such as "Is anyone here?" or "will you allow us to talk with you?" in a clear, loud voice. Announce any noise that has a natural cause (such as a cough or a car going by). Feel free to ask questions, just remember to leave plenty of time between each one to give anything that might be there a chance to respond. Make sure everyone is as completely quiet as possible. Many photographs that can appear paranormal actually are nothing more than pareidolia (also known as matrixing). This is when a nondescript object seems to appear as something specific. It is the mind looking for something familiar. If any "orbs" are captured... there's a 99% chance that it is dust on the lens or some kind of moisture. This is the main reason it is so important to make sure the equipment is clean. Even so, if there is dust in the area being investigated, those little spheres that show up in a picture are most likely cured by a good vacuuming of the area! So always keep these things in mind when looking over photographs. Eliminate any possible causes for drafts that would change the temperature of the room, as well as any source of power that would change EMF readings. When all of the evidence has been gone over and if you feel you have captured something... then would come the time for it to be looked at by a knowledgeable and reputable source in examining paranormal evidence. Be sure all pictures are originals, so that the exif information is included. Exif information tells everything about the camera when the picture was taken. If the camera had any faulty settings or long exposures, it would be able to be seen with this information. Once the investigation is completed, it is then time for the many, many hours of going over evidence. Video, pictures and recordings must be pored over and closely examined. The records of the EMF meters, thermometers, and any other equipment used has to be noted for any changes or patterns. Another several hours will be spent listening to the audio captured for any EVP's. Once all of this is done, and if there is anything captured that raises a question... it then comes time to rule out any natural causes for the evidence captured. All in all... seems like a lot more time is spent debunking than actually finding paranormal evidence. This may be true, however it does no good to have evidence that can be otherwise explained. Many amateur ghost hunters pop up and present pictures and EVP's as "proof" of spirits... only for it to be explainable. It may make for some interesting stories and chills... but it brings us no closer to finding real evidence of ghosts, UFO's or any other paranormal activity. To understand what lies beyond what we see, we have to first know what it is that we are seeing. If it turns out that it isn't paranormal, it is better to report that. There is still evidence, especially in EVP's, that has been captured and has no real explanation at this time, although it is few and far between. An educated and honest approach to investigating are the first steps in finding answers in a field that has so many questions left to ask. Written by Angela Sangster, Copyright 2010 TrueGhostTales.com all rights reserved. Special thanks goes to "UglyNRude" of Debunk the Paranormal for his valuable input.